Herb likes spicy food, but isn't much into dancing; his girlfriend Rosemary likes Latin music and goes out cutting the rug every chance she gets. Is there any chance for this relationship? You bet! Send them both to Oxnard, California's annual Salsa Festival, now in its smash 17th year. It's a fiery food festival and dance celebration centered on both meanings of the term "salsa". The quiet coastal city of Oxnard heats up every July as downtown's Plaza Park and the surrounding area is transformed in to a Latin block party of epic proportions. I was expecting a DJ to be playing Latin music, or one of the local stations blasting its music through a few stacks of speakers, but the event featured live Latin bands, and damned fine ones to boot. A wooden parquet floor was laid out in front of the concert stage, and it was difficult to carve out an area where you could get down without crushing someone's toes. The dance floor was cordoned off, and just as many people were sitting outside the area enjoying the music. To the left of the stage was a beer garden and to the right a wine tasting tent; despite the free-flowing alcohol, people were well behaved, perhaps because it's hard to start trouble when you're having fun. There were several rows of tents selling the typical goods you expect to see at California festivals, but being that this is a salsa festival there was also a variety of vendors selling hot sauce, salsas and even pepper plants. 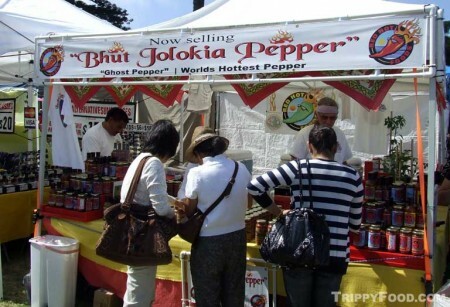 One booth was devoted to the bhut jolokia pepper of India, commonly referred to by Westerners as the ghost chili. Guinness Book of World’s Records recognizes this bad boy as the world's hottest pepper; for reference, the fiery habanero weighs in at around 300,000 scovile units (denoting the amount of capsaicin, the chemical compound that causes that wonderful burning sensation). The ghost chili boasts a scovile unit rating of over one million, making it a force to be reckoned with on both the input and output phases of consumption. The vendor, Red Hot Foods, offered four levels of hot sauce, with the "milder" versions toned down with that wimpy habanero. Level 4 with the black label is all bhut jolokia, baby, and ready to lay waste to all it comes in contact with. I decided to try some, and when asked which level I wanted, well, I always bet on black. The woman at the booth poured about a quarter of a teaspoon on a tortilla chip, which I subsequently popped into my mouth and let rest on my tongue until the chip started to dissolve. The ensuing chaos was reminiscent of the scene in the movie Alien when the crew of the Nostromo discovers the aliens' blood to be highly acidic, burning through several decks of the ship. As the chip burned away I could taste the flavor of the pepper, until I swore I could smell the smoke of searing flesh. The sauce burned a hole through my tongue and then started corroding my lower jaw, opening a hole in my neck where the dripping mix of fiery bhut jolokia and liquefied flesh dripped onto the pavement, burning a hole into the asphalt. It felt like that, anyway. Claudia and I decided to take a break and find some coffee with lots of cream to extinguish the pain, sitting in front of the La Costeña truck. This massive vehicle almost qualifies as a food truck, but they were having people play spin the wheel to win cans and jars of peppery foods available in most area grocery stores; it didn't seem like any of that real estate was used to cook or prepare any food. Since food seemed like a good idea, we walked over to the crescent that lined the curb on the 5th Street side of the park where the food vendors set up shop. Claudia decided on a couple of carne asada tacos, which looked mighty tasty, but I was in the mood for something a little more exotic. One vendor was selling "authentic English-style fish and chips"; what they were doing at a salsa festival was anybody's guess. El Oaxaco had a banner advertising that they had chapulines, and since I hadn't had my USDA daily requirement of grasshoppers, I decided to try theirs. I was informed that they didn't have them at the booth, but that their restaurant was across the street and I could order them there. Since I was in the mood for eating a fuera (the Spanish equivalent of al fresco) I ordered a chicken mole tamale. 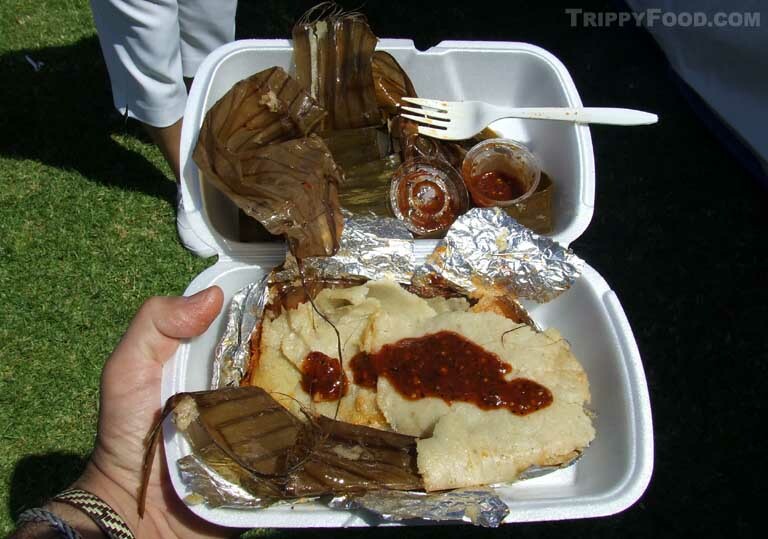 The tamale appeared to be wrapped in about ten feet of banana leaf, but every layer pulled back revealed more and more of the rich, spicy tamale. Rather than being smothered in mole, it was mixed inside the tamale, creating a different taste sensation than I am accustomed to, but it was delicious nonetheless. This entry was posted in Trippy Happenings (Events) and tagged CA, capsaicin, festival, ghost chili, habanero, jalapeno, Latin, mole, music, Oaxaca, Oxnard, pico de gallo, salsa, Vallarta, verde. Bookmark the permalink. Buttermilk? You’ll probably need whipping cream depending on the dosage. The pain lasts longer than the flavor, so I’d have to gravitate more to the lowly habanero, although you should try the ghost chili just to say you did. Plaza Park, Downtown Oxnard, 11 a.m. to 7 p.m. 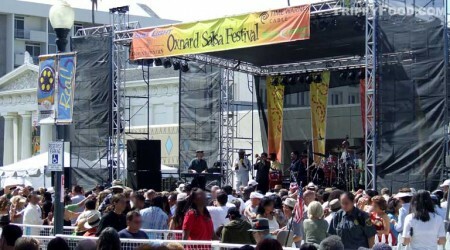 The 18th Annual Oxnard Salsa Festival celebrating salsa food, music and dance will be held on July 30-31, 2011 at Plaza Park, Fifth and B Streets, in historic downtown Oxnard. Everything salsa – the food, the music, the dance – in on the menu at this popular regional festival. Event admission and parking are free. For Festival information, call 805-247-0197 or visit http://www.oxnardsalsafestival.com. Thanks for the update Janis – if it’s anything like last year’s event it should be a hot time!